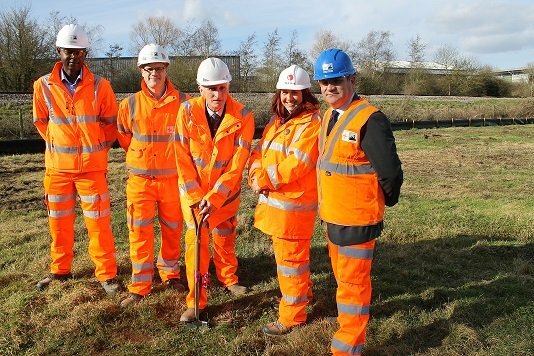 Work has now started on preparing the site where the new Worcestershire Parkway Regional Interchange Station will be located. Worcestershire County Council’s plans for the new station were given the official stamp of approval by the Department for Transport at the end of January 2017. Specialist rail contractor Buckingham Group Contracting Ltd were recently awarded the design and build contract for the scheme by the Council. This includes carrying out de-vegetation work to allow the site to be prepared ready for development. Following completion of the clearance work and approval of final design work in summer 2017, construction will begin in autumn 2017. Due to the sensitive ecological nature of the area, a pre-construction ecology survey was completed before works began and an ecologist will be on site at all times during the de-vegetation. Worcestershire Parkway forms part of the County Council’s Local Transport Plan and Worcester Transport Strategy and is pivotal to its ambitious growth plans to boost the County’s economic value to £2.9bn, creating 25,000 new jobs by 2025. The majority of the budget for the scheme will be self-funded through station car park fees and access charges levied on the Train Operating Companies, along with £8.3m from Worcestershire Local Enterprise Partnership through the Government’s Growth Deal. Construction of the station is due to be completed in winter 2018/19. Once operational, it will make it easier for many more passengers to use the County’s vital ‘North Cotswold’ rail link from Worcester to Oxford and London Paddington. Worcestershire residents will also be able to catch regular long-distance cross country services which currently pass through the County on the Gloucester to Birmingham route without stopping. The station will also create an integrated hub between bus, road and cycle routes, reaffirming the importance of the current improvements to the Southern Link Road and development of Worcester Six Business Park.